Walking back from dinner, following the blue dot on my iphone map, we wondered why Borgo Pinti seemed so dark and quiet. ‘The hotel is on this road, right? We didn’t pass it?’ As the blue dot drew nearer to the Four Seasons Firenze, I remembered the flag hanging perpendicular to the front door, and just in time to reassure us, a gentleman exited to retrieve a guest from a black town car. One who allows reputations to proceed might assume that any and all Four Seasons are inevitably opulent, overly elaborate, eager to announce themselves. In truth, the properties are just the opposite. In almost all of their locales, they are tucked away, unostentatious. Class and prestige come naturally, maintained by exceptional teamwork and a pride so humble and affable, it is likely taught by osmosis. I enjoy small properties where I can quickly get to know the staff and they me, and I very wrongly assumed that I would fall between the cracks at a larger chain, that our stay would be a less than personal experience. 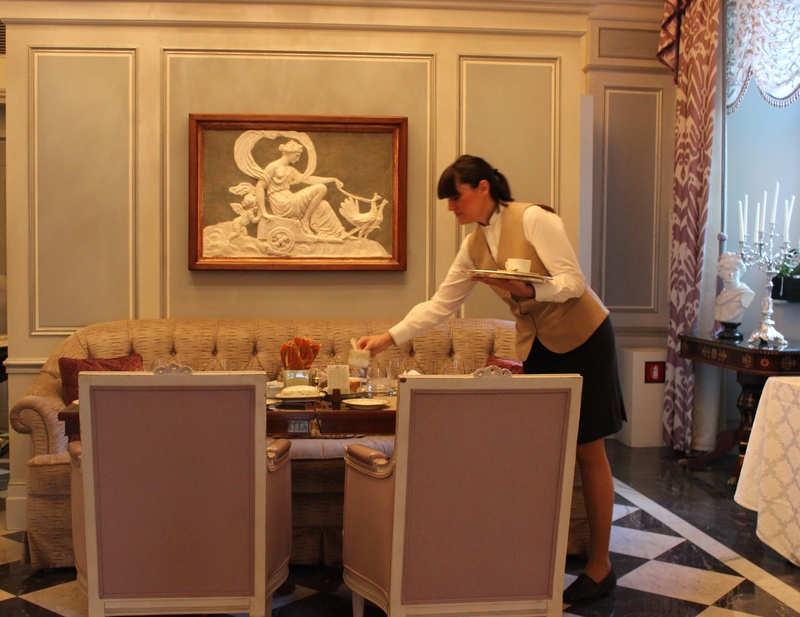 Upon check-in at the Four Seasons Firenze, I was on the look-out for stuffiness and snobbery, neither of which were remotely detectable. In fact, the staff were some of the warmest, most gracious, convivial, and approachable that I have encountered. I attribute this to two factors: their Four Seasons training and their Florentine nationality, no difference whether or not it is their home or their adopted city; it is a culture with a social consciousness that knows no other way of being other than warm, welcoming, helpful, and sanguine. A particular highlight of the trip was at the concierge desk, where one cannot help but become lifelong friends with whoever is there to guide and suggest. Marzio, a Florentine by birth and a former guide, was absolutely bubbling with knowledge about his beautiful city. After having a most candid discussion on a few local restaurants outside of the city center, we segued into a conversation about the various neighborhoods. With subdued theatrics, Marzio gave us a captivating, colorful history lezione of how affluent areas like Fiesole and Michelangelo came to be, and how vital it was to be up high, looking down on one’s people. Another Florentine lesson learned at the Four Seasons: the week of our stay was the anniversary of the Flood of 1966, when the Arno overflowed and the highest water level was over 22 feet tall. Many were killed, 5000 families were left homeless, and millions of masterpieces (about 14,000 moveable works of art), were damaged. Marzio, with his contagious buoyancy, his genuineness, and his Florentine hospitality, is one of the many reasons that I am so enamored of this passionate city and its kindhearted people. 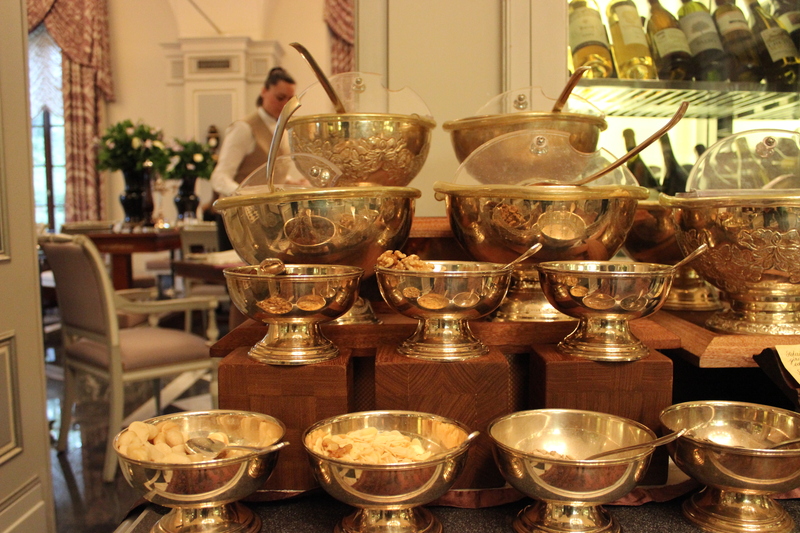 That so many of them elect to work at the Four Seasons Firenze, and that they are so truly happy to be a part of the team, is a nod to the success of the property and to the Four Seasons brand itself. 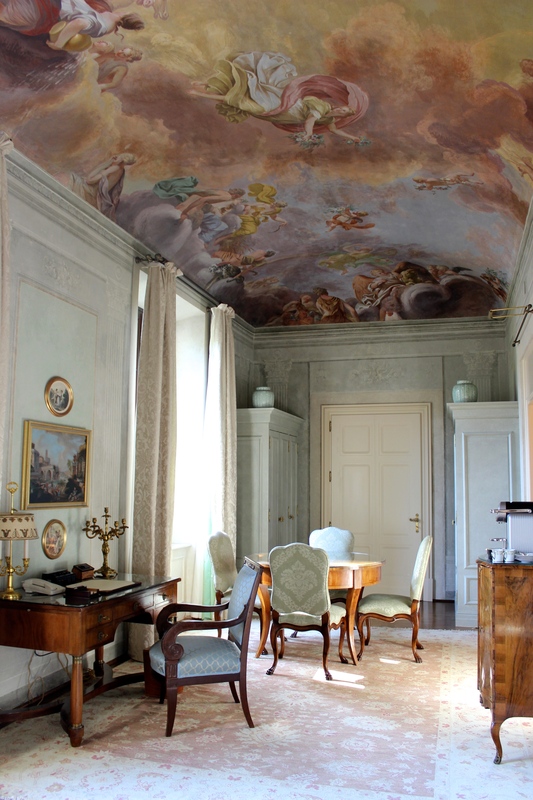 Similar to how Florence is not so much a city but a large town, FS Firenze feels less a city hotel and more-so a city-retreat, as it is surrounded by the largest private garden in Florence, and its quiet location on the far north side of the Arno awards it with a local hum. I highly recommend a morning at Mercato Sant’Ambrogio in Piazza Ghiberti, just a six or seven minute walk from the hotel, to experience the best local Fiorentini mercato in Florence. You will spot few tourists. If any are seen within the vicinity, they have likely stumbled upon it by accident en route to Cibreo Café, the casual offshoot of one of the most pricey restaurants in Florence. Also nearby, Pizzaiolo is a Florentine favorite. 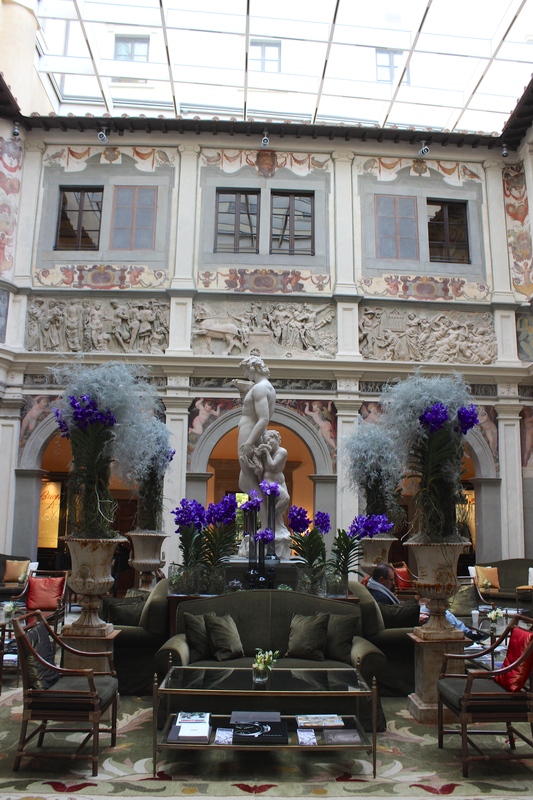 Exquisite, ever-changing floral arrangements at the Four Seasons Firenze, which stand their ground as works of art next to original furnishings, statues, and carvings. 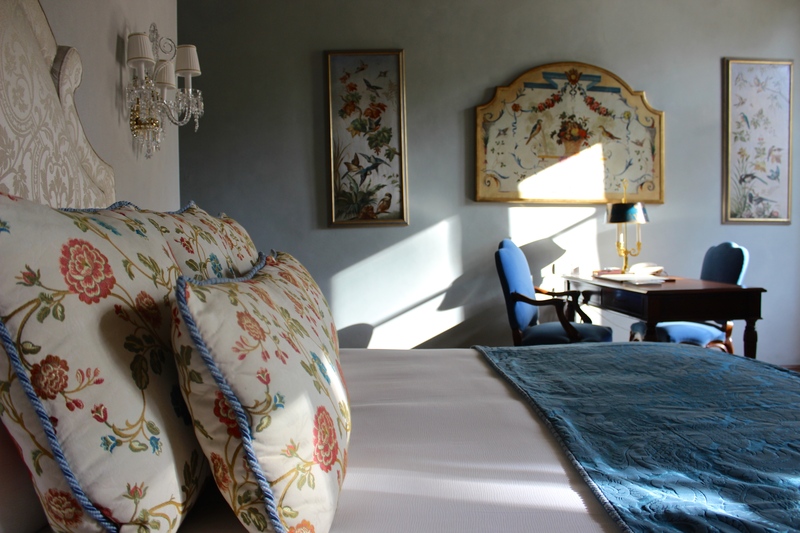 After hours of walking in the hubbub of the centro, or in and around Boboli on the Oltrarno, it is to breathe a sigh of relief to return to the Four Seasons in its farther north location. 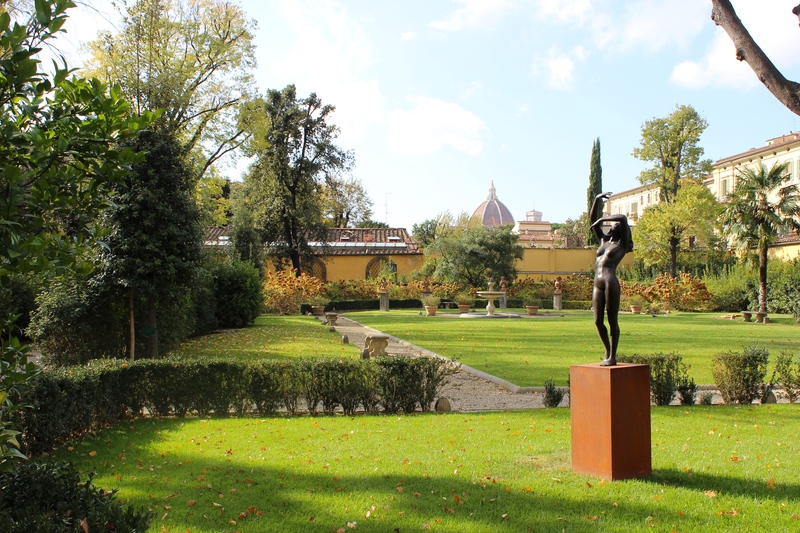 To wake in the morning and wander around the magical Giardino della Gherardesca, a botanical haven enclosed between the main palazzo and the Conventino, is to be transported to another time in Florence’s history. 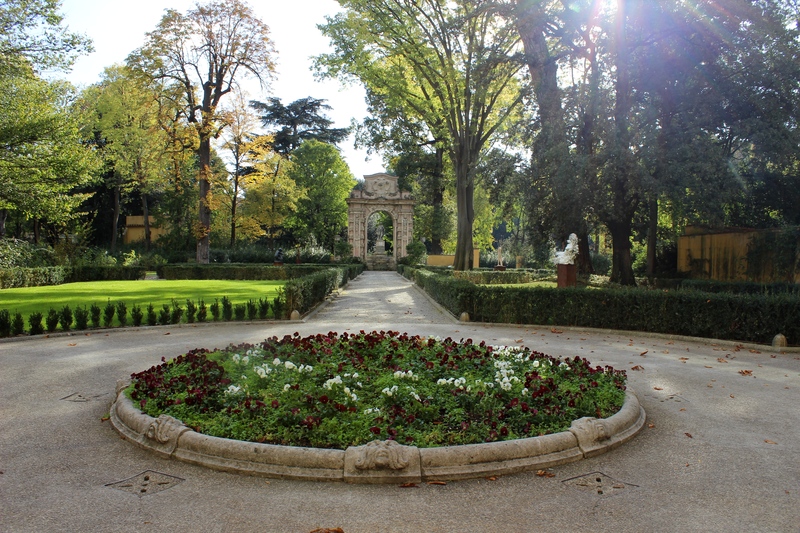 It is a suggestive garden, now especially with its figurative sculptures, and with its meandering white cobbled paths and its many shades of green. 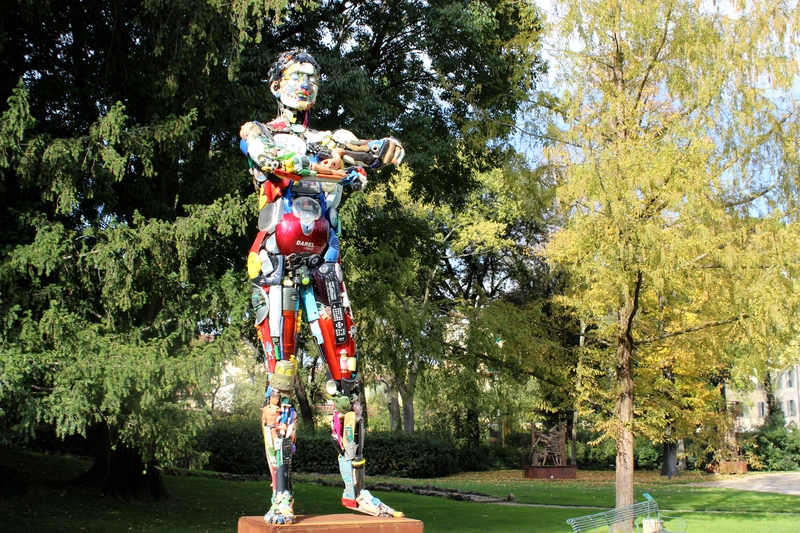 Presently, it is home to a contemporary display of sculptures by Ugo Riva. 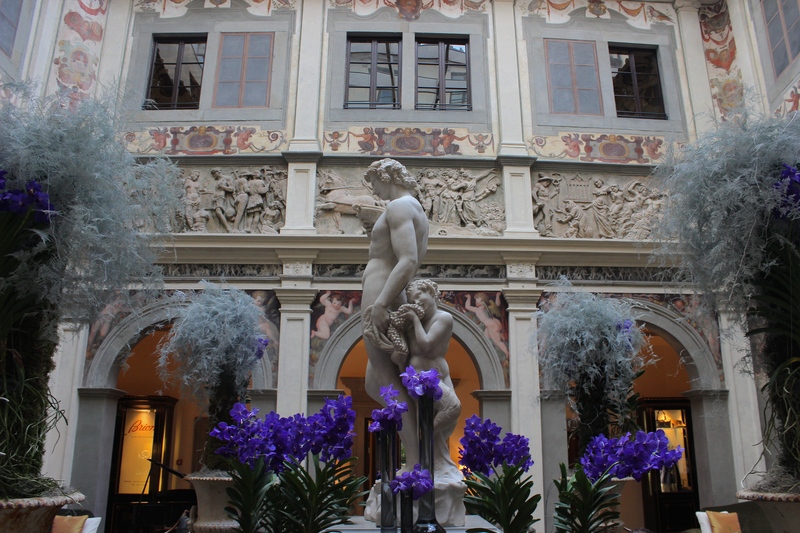 The Florentines are a very proud people; proud of their history, their heritage, and their incomparable contributions to the schools of art and history, and Four Seasons Firenze is no exception. 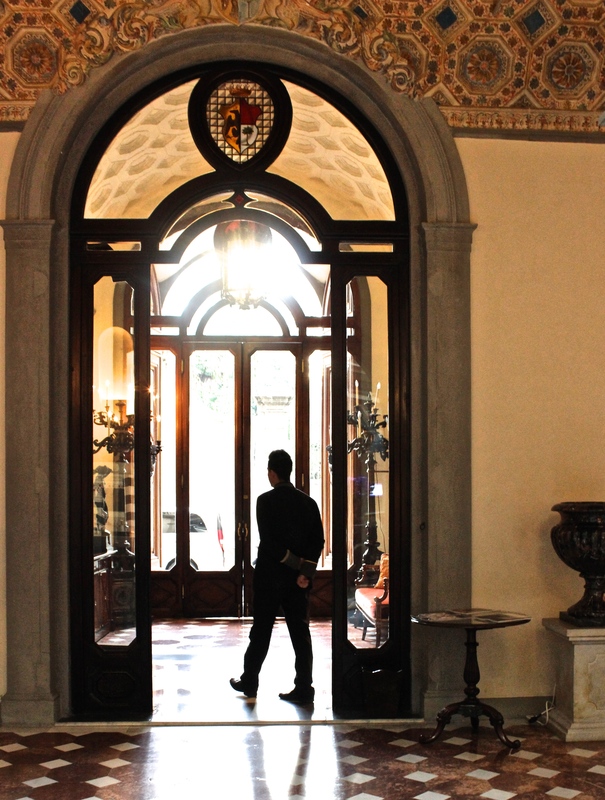 The hotel is no more or no less part of the Florentine community than their neighbors on Borgo Pinti, and they welcome local artists, clubs, culinary circles, historians, and other cultural groups for exhibits and events that celebrate their people. Helmed by highly esteemed Four Seasons veteran Patrizio Cipollini, expert in his field and in all things PR, the property sails light as a feather, well-connected and respected by the local community, sister properties, and other luxury hotel companies. The entire property was designed by world-renowned luxury hospitality designer Pierre-Yves Rochon, also of Four Seasons George V Paris, London Park Lane, Hotel des Bergues Geneva and others. With respect and homage to existing frescoes, mosaics, silk wallpapers, bas-reliefs, and stuccoes, Rochon managed to evoke the very essence of the renaissance without overstepping into opulence and uncomfortable grandeur. 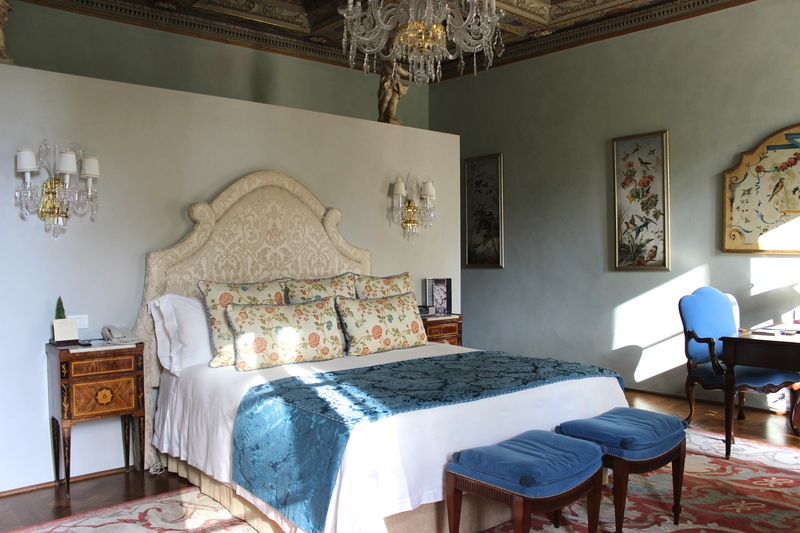 Each of the 116 rooms, suites, and bathrooms within the 15th century palazzo and the 16th century convent is of a different color theme, all adorned with the highest quality fabrics, rich jewel tones, yellows, and greens complemented by soothing creams and neutrals, original furnishings and period pieces, impressive moldings, carvings, and more Carrara marble than has ever been extracted from the town of Carrara in one fell swoop. There is a certain solidarity and strength to each room; each dignified door is nearly as thick as the length of my out-stretched hand (nearly), the glass shower doors as thick as my outstretched thumb, the gold-rimmed bathroom mirrors large enough to reflect the entire room. A unique chandelier can be found in every sitting room, bedroom, and bathroom,as well as renaissance antiques uncovered from far corners of the world. While some hospitality designers lose sight of the practical needs of a hotel (for example, in a narrow hallway, to have two closets perpendicular to one another and a bathroom on the third side means one cannot exit the bathroom if a closet door is open…), Yves Rochon did not miss one minute detail. He designed each room, each corner, each desk space as if he lived in each room, each corner, and each desk space for a month at a time, in order to truly understand and experience the space. Rochon also designed the 8,500 sq ft spa, a separate structure that abuts the pool and which connects to the gym, changing lounges, and yoga studio via an underground passageway. 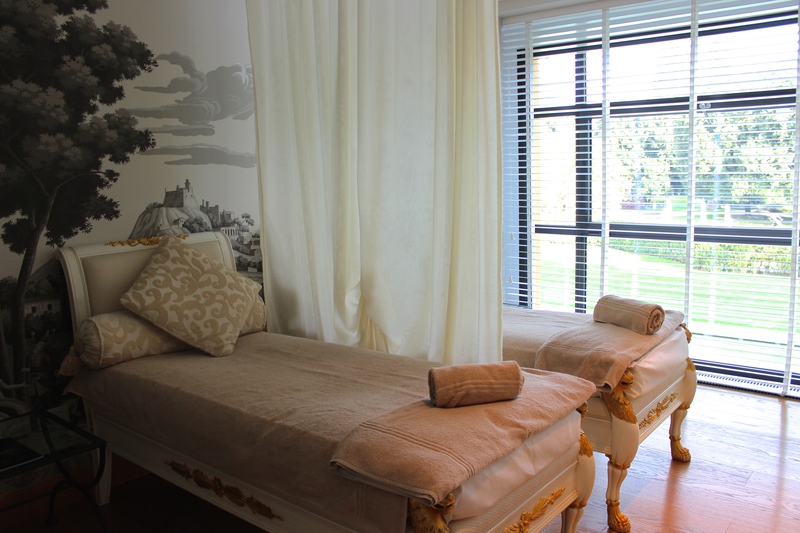 With floor to ceiling windows and the greenery of Gherardesca on all sides, the spa exudes an open, airy quality, with its elegant chaise lounges in shades of cream and pale pink, its second-floor windowed treatment rooms, and its clean architectural lines. The separate fitness facility has all of the accoutrements of my exuberantly expensive Manhattan fitness club, and the yoga studio gave me a quiet spot to stretch and regain muscle composure before full days of exploration. 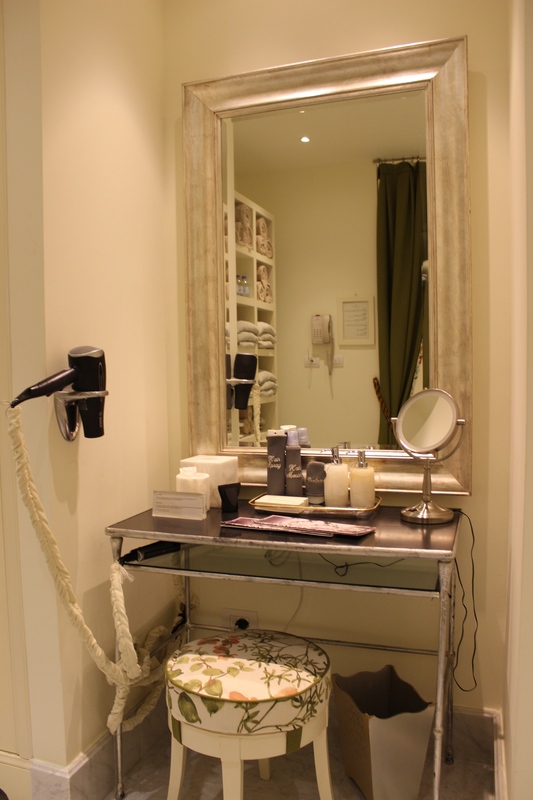 Downstairs, the changing room was a girl’s dream come true, another cream-composed airy space with elegant details, lush towels, and luxurious fabrics. I fell quite comfortably into my routine at the FS Firenze (a morning walk around the 11-acre garden before breakfast, a stretch in the yoga studio, fresh fruit, cappuccino and other homemade goodies in the magnificently light breakfast room, small jokes with the jovial gentleman who served my second cappuccino, a quiet afternoon with an Italian magazine in the salon, apres-dinner chats with Marzio… but there are numerous other activities that I would have taken advantage of if I had the time. How incredible it would have been to spend a few hours in the greenhouse with floral designer Vincenzo Dascanio, creating the perfect bouquet. How much I would have learned about the city and its environs if I had taken advantage of a guide/driver for a day in order to put all of the magnificent architecture into context. How I would love to visit the property each month, to witness the changing of the flowers, decor for each holiday (I hear Christmas is a wonderland in the interior courtyard), and to sample Michelin Chef Vito’s Tuscan cooking as the region’s ingredients change with the seasons. I can feel the Tuscan sun on my shoulders while dining at Al Fresco, the outdoor warm-weather restaurant. I suppose I have no choice but to return… molte volte. Iris Sensations treatment at the spa (A full-body treatment featuring a combination iris powder scrub and restorative arnica body wrap, followed by a relaxing massage.) 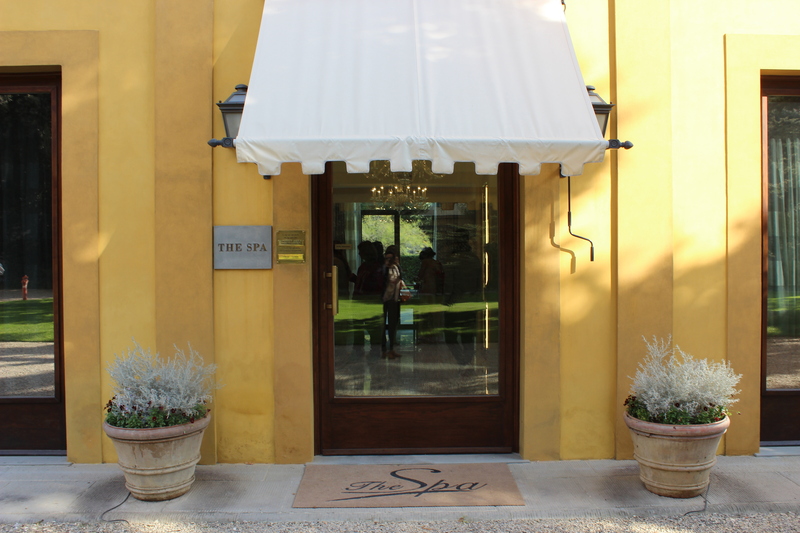 It is worth noting that the spa was named Best Urban Spa in the Italian Spa Awards 2014. 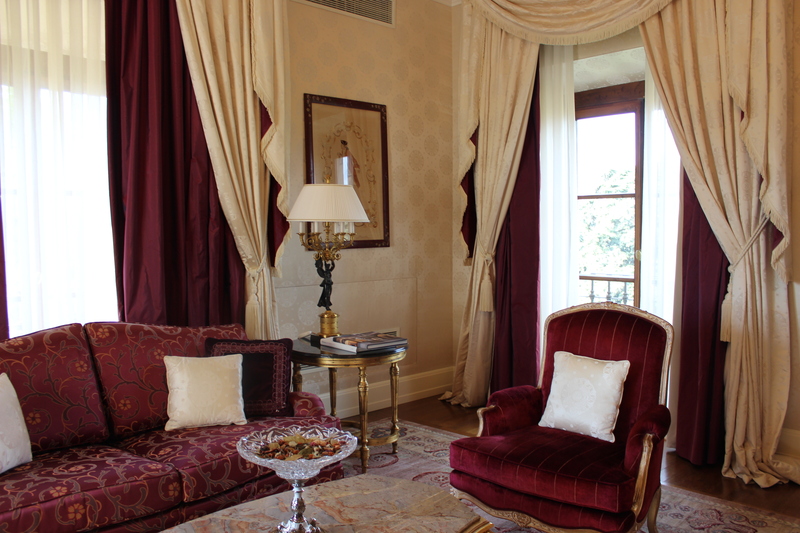 The soothing presidential suite in the Conventino at the Four Seasons Firenze. 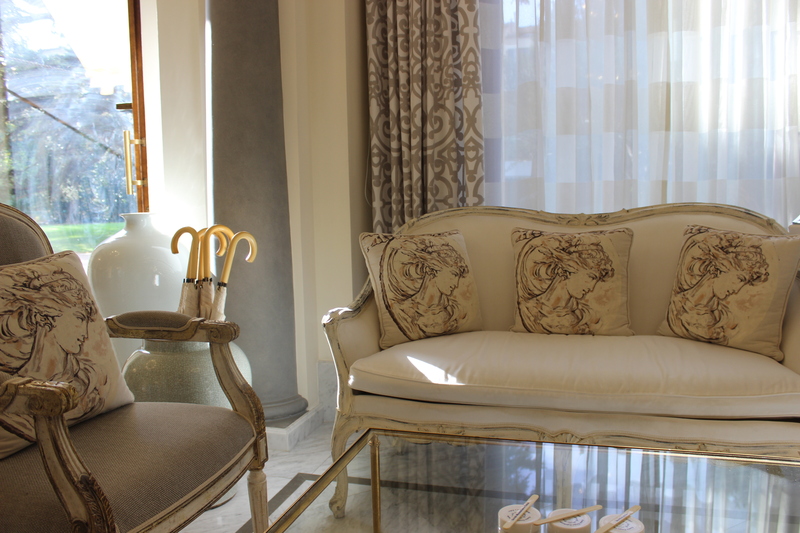 Morning light in the bedroom of the Conventino’s presidential suite. 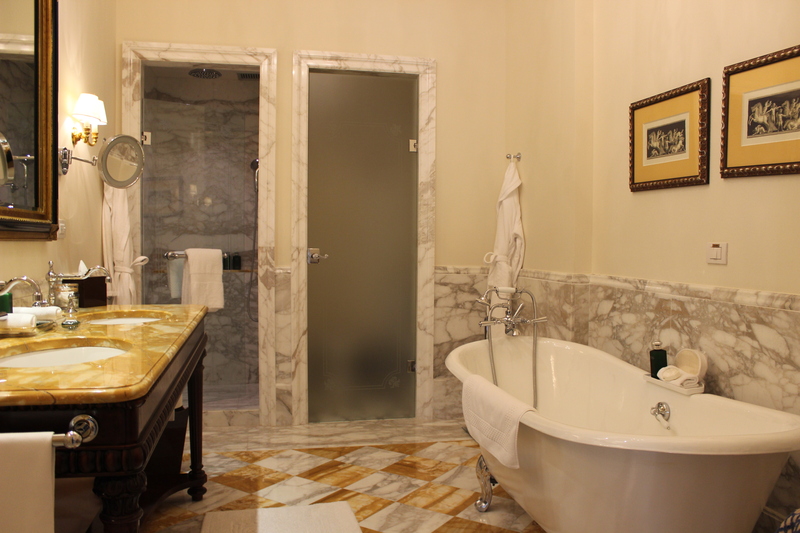 One of many luxurious bathrooms at the Four Seasons Firenze. 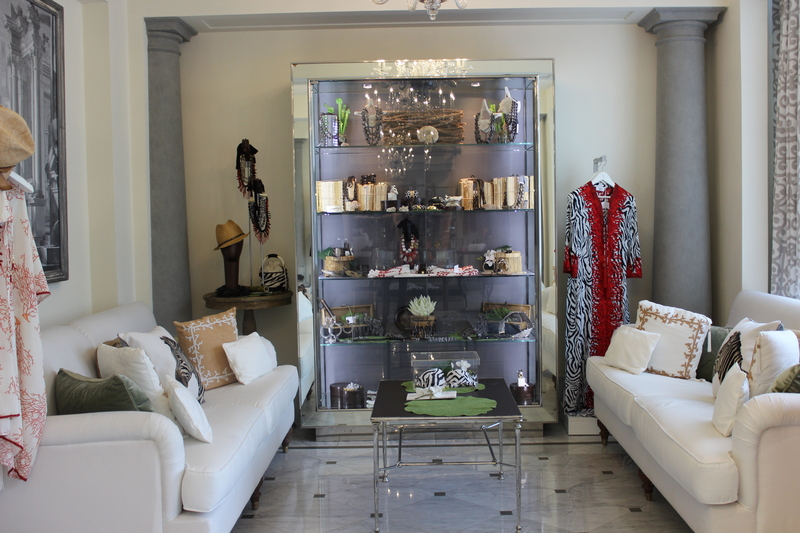 Each is a different color theme and adorned with Carrara marble and a unique chandelier. 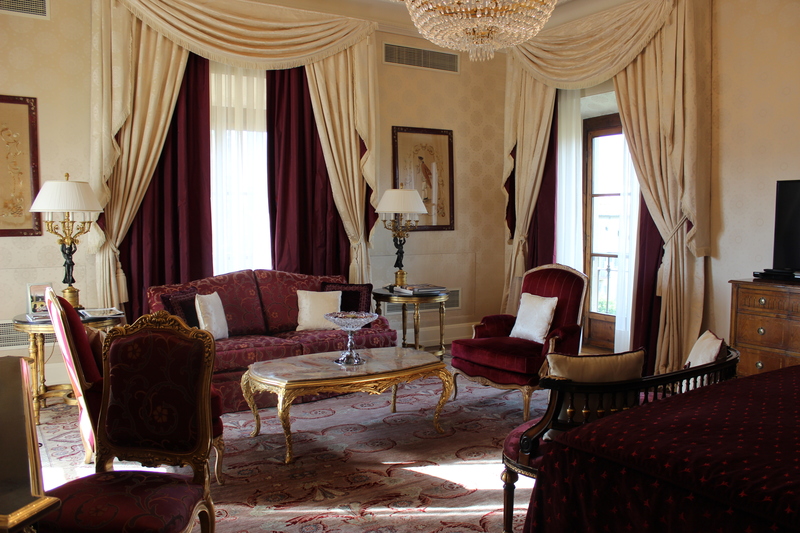 A beautiful ruby room in the palazzo at Four Seasons Firenze. 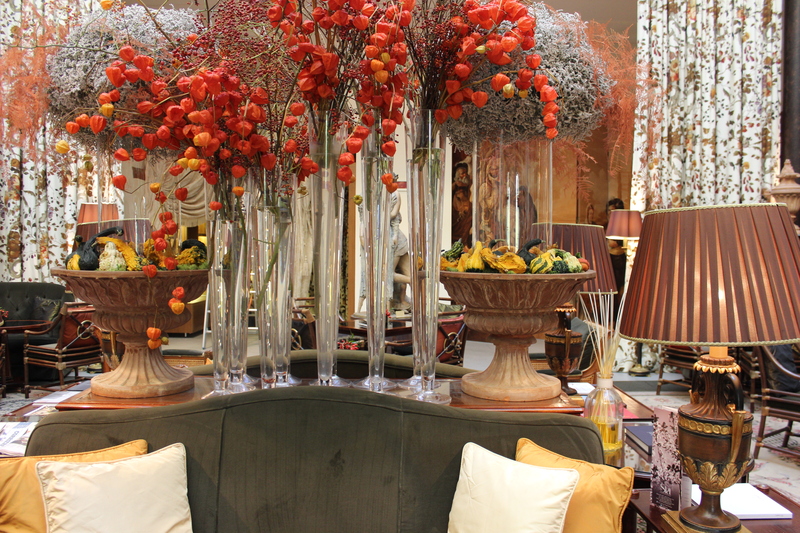 For this suite, Yves Rochon chose rich rubies and creams in velvet and silk. The oversized bath, bathed in morning light. 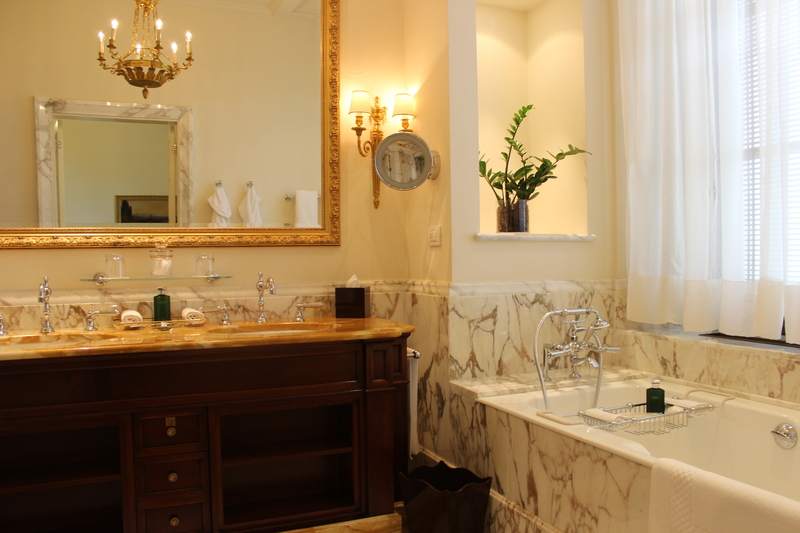 Each room, suite, and bathroom at the Four Seasons Firenze is different than one another. 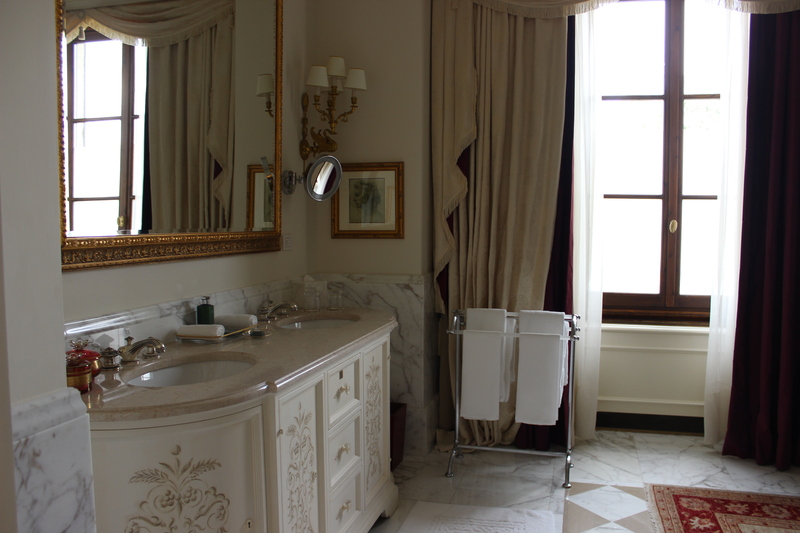 This bath is a mix of masculine and feminine wood tones and carrara marble. I especially love the oversized mirrors, the sunken shelf within the bath wall, and the simple green plant. In the ruby/cream suite, the hand painted vanity, area rug, and corner sconces are just a few small touches that make the Four Seasons Firenze feel like a home. Back to the interior courtyard, a comfortable, light, airy spot to relax. At night, the room is often home to intimate events and cocktail hours. 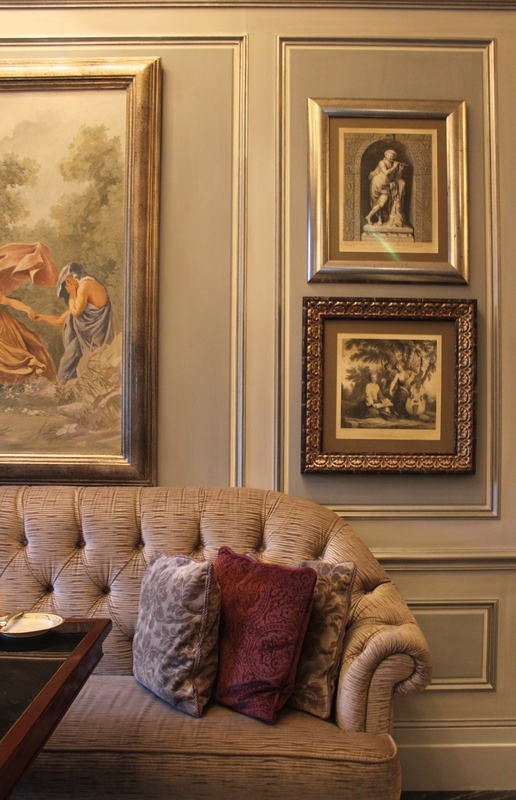 Classic art, velvet pillows, and a beautiful menage of jewel tones at Il Palagio restaurant in the Four Seasons Firenze, home to breakfast, lunch, and dinner. 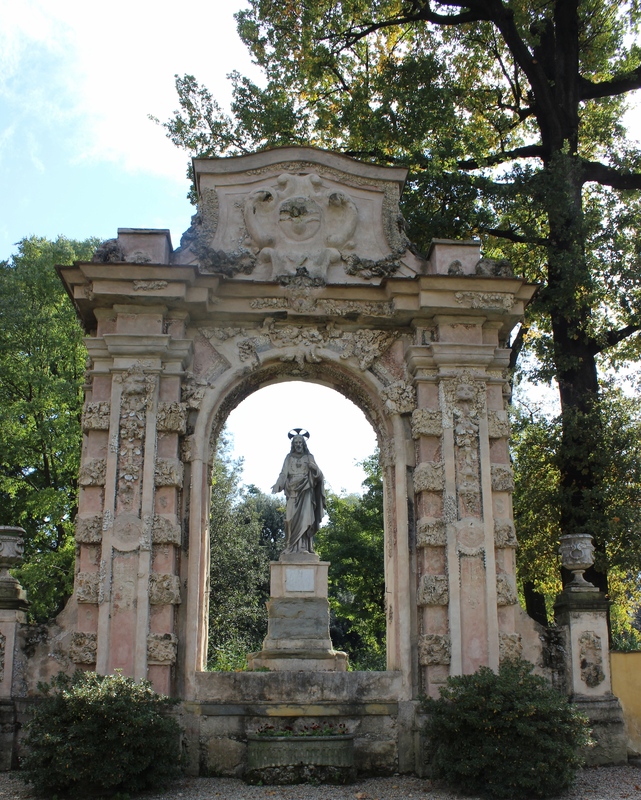 One of many Italian statues on display at the property. Breakfast is whatever your heart desires. 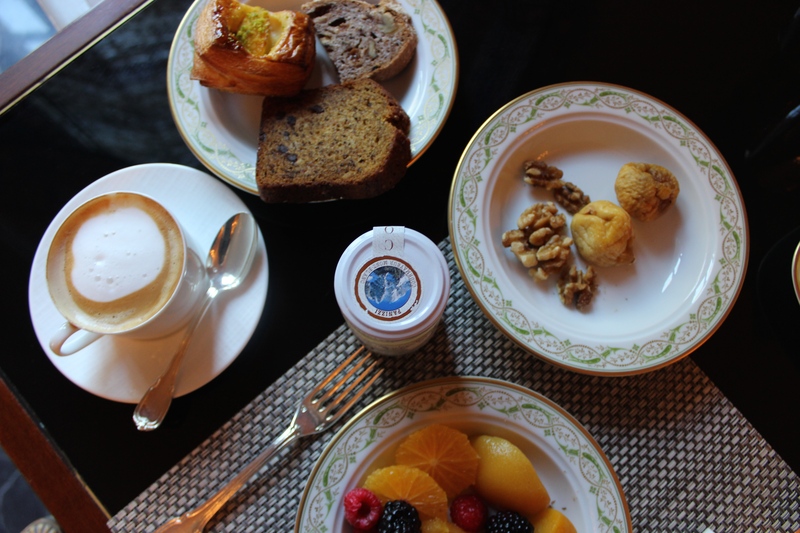 Homemade cakes (the banana chocolate was my downfall), warm croissants, dried fruit, frutta di stagione, stewed fruit, yogurts, breads, nuts, cereals, cheeses, salmon, tomatoes, not to mention the entire menu of made-to-order breakfast options. 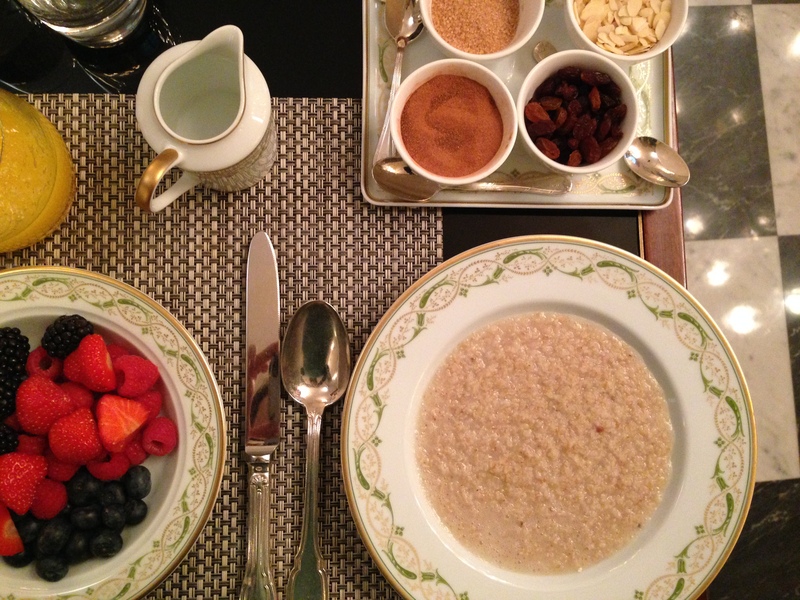 Perfetto for a chilly morning: hot oats, fresh berries, and lots of spices. The 8,500 sq ft spa designed in soothing cream tones has a private couples suite with floor to ceiling windows overlooking a private garden. 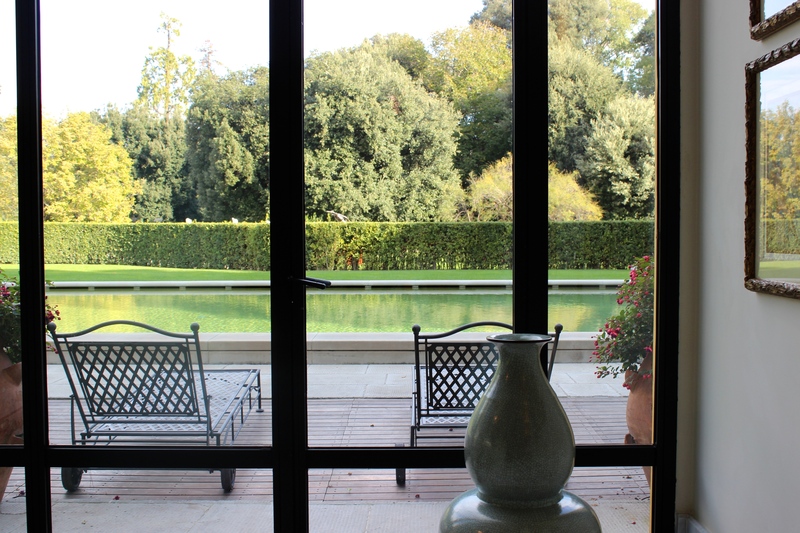 The otherwise modern space is designed with clean lines, open passageways, and floor to ceiling windows throughout, which overlook the pool and the Gherardesca garden. 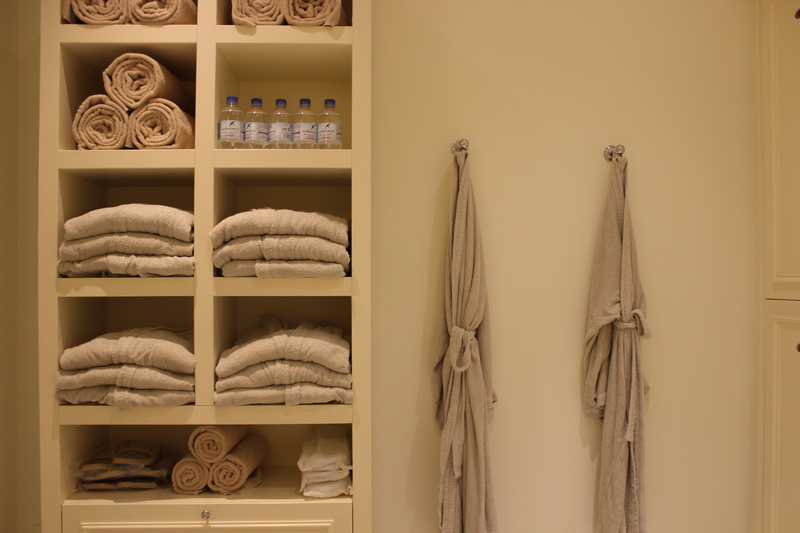 The entrance room at the spa. The downstairs entrance area at the spa. The upstairs waiting room at the spa. 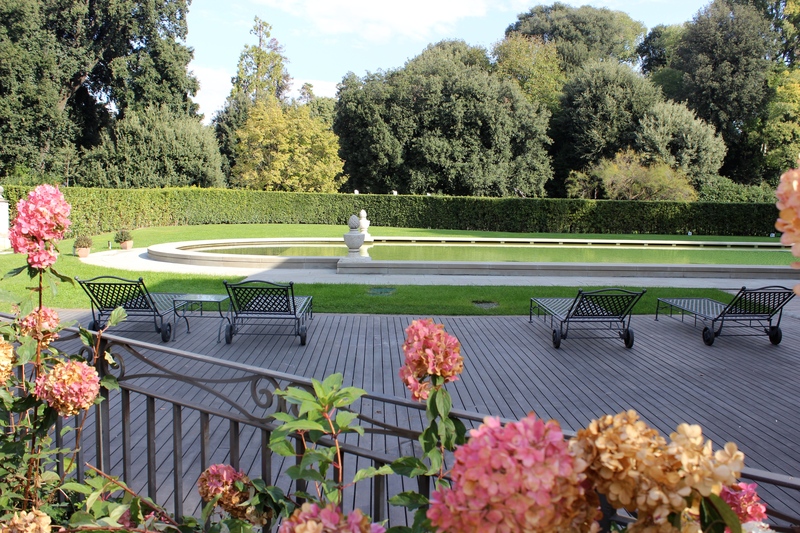 The pool at the Four Seasons Firenze, closed after the last of the warm weather. 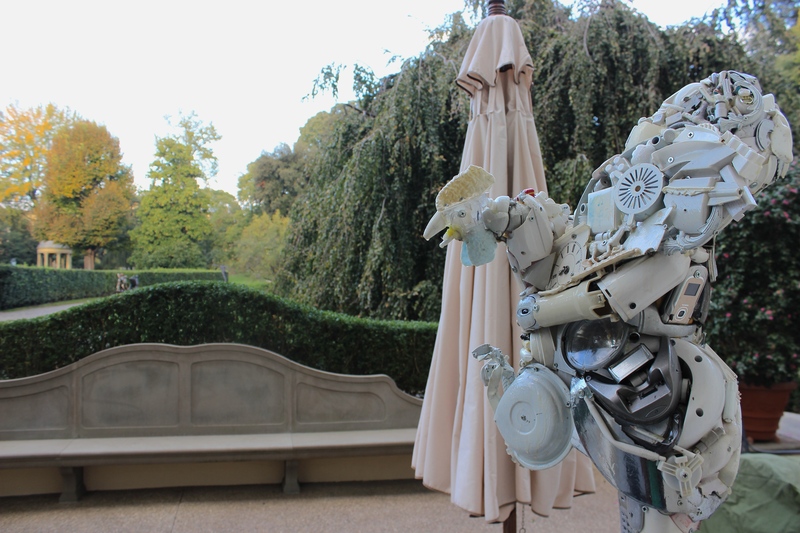 Each year, the Four Seasons hosts a local art exhibit in the Gherardesca Garden. 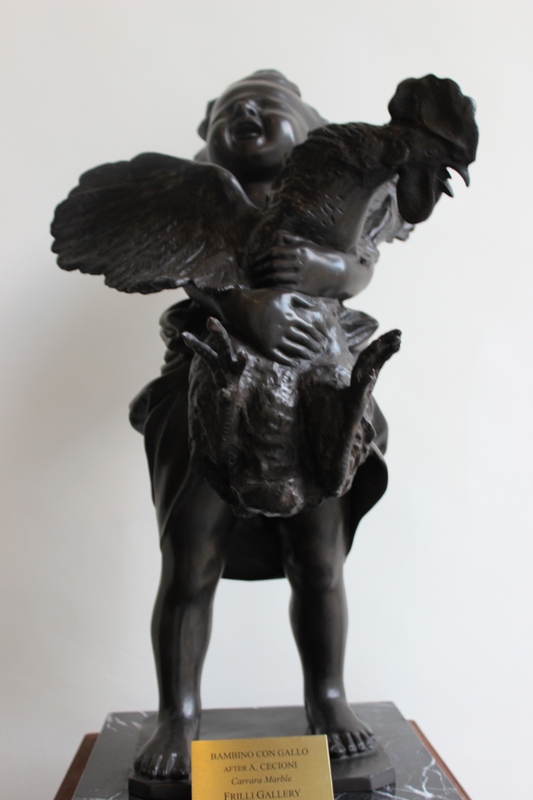 This year, Ugo Riva exhibits his ‘contemporary’ take on ancient sculptures. 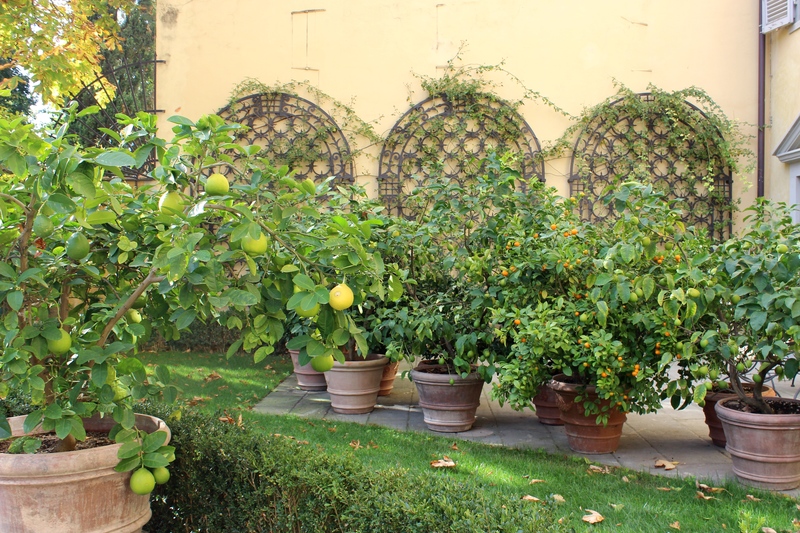 Fruit trees congregating outside the Conventino. 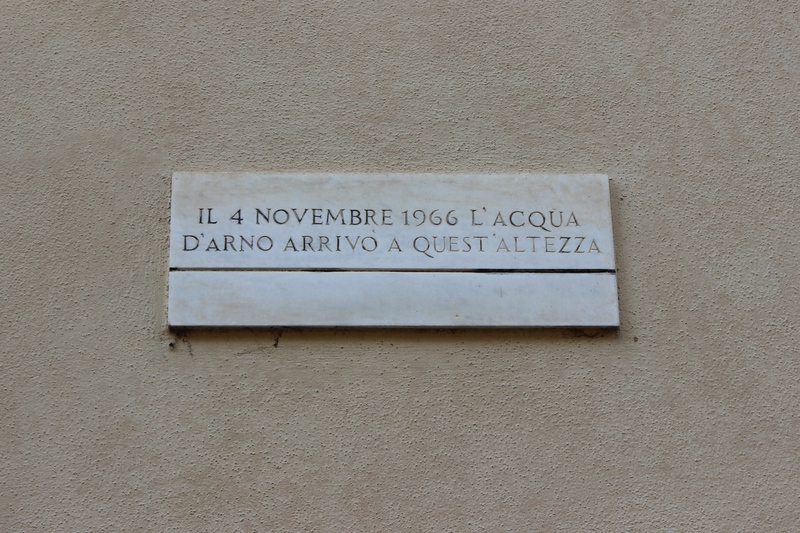 A plaque on the exterior of the Four Seasons Firenze to remember the height of the water on the day of the flood in 1966. This was over six feet tall. Vanity in the ladies lounge. 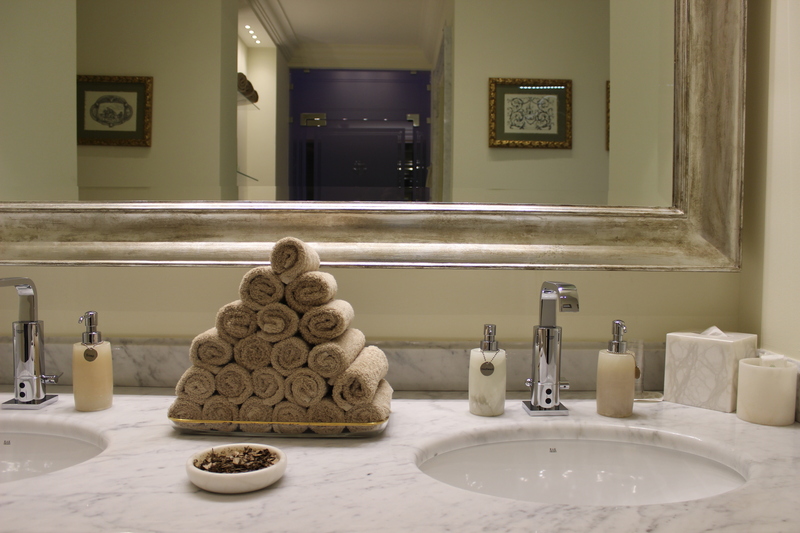 Creams and soothing neutrals in the ladies lounge. 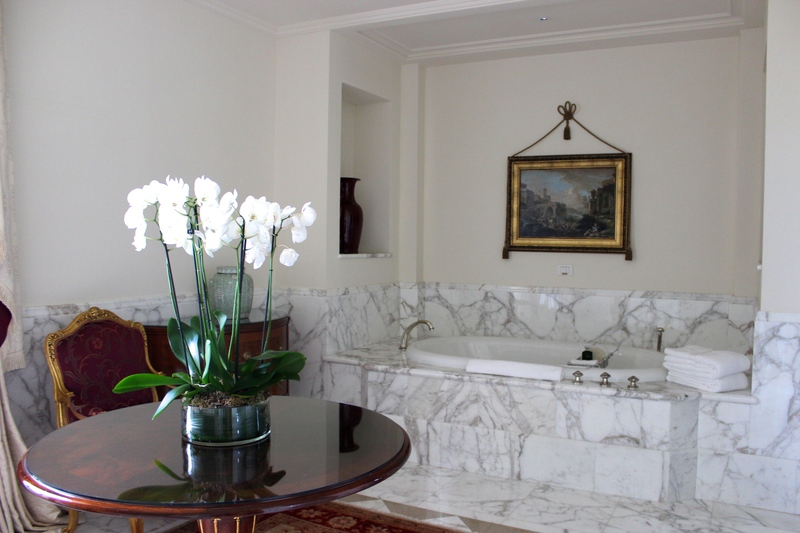 Another dream bath is to be found in the ladies lounge. Really appreciate your candor in recommending this property. I’d love to meet the people you so graciously described. Thanks, too, for the information on the Flood of 1966 — a disaster that does seem to have a happy twist to it, based upon your observations. 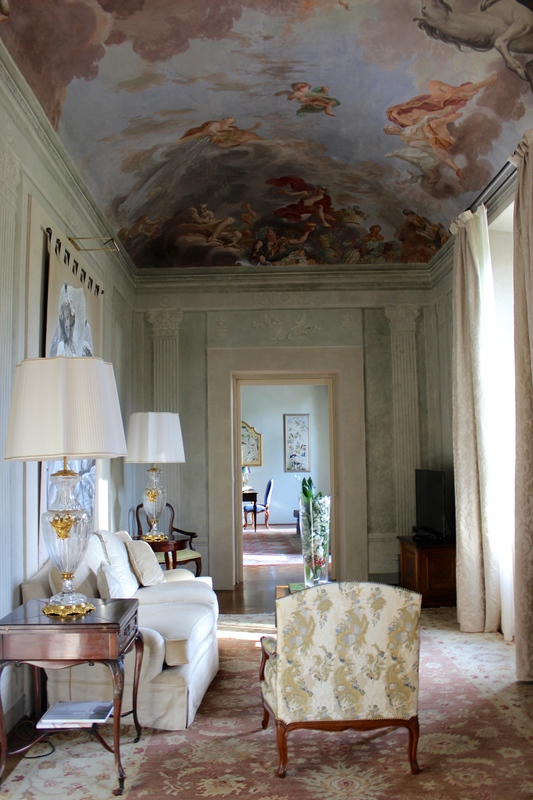 Thanks for letting us stay vicariously in the Four Seasons Firenze!